Like other assets such as your house, car, pond or barn, roads need to be maintained to keep their practical values noted above, as well as value of investment. 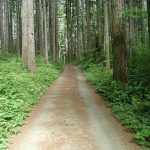 But in contrast to the buildings or other infrastructure on your property, with a road, a woodland owner takes on some legal responsibilities to maintain them. That is because, for all their benefits to a landowner, road systems also have the potential to do significant harm to the environment by creating barriers to fish passage or allowing erosion and delivery of sediment to streams. 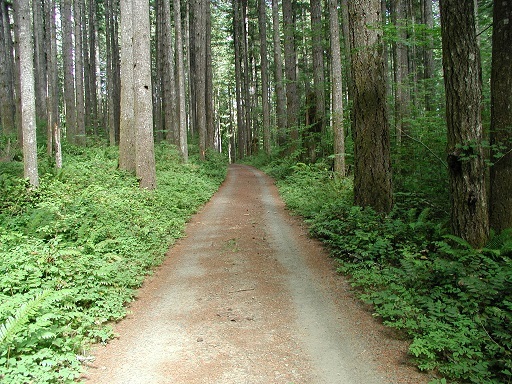 A forest landowner is expected to keep roads in good repair to prevent such harm to the environment. The type, timing and intensity of maintenance will depend on the type of road, location, construction and its use: A rock road used to haul logs down a valley in the winter is very different from a dirt road along a ridge with light seasonal use. Every landowner needs to avoid delivering sediment to our streams. Key objectives embedded in both road design and maintenance activities are to get water off the road surface quickly (avoiding ruts), and draining that water onto the forest floor well away from steams. That is why after heavy use, roads are often re-graded to eliminate ruts, re-establish an outward slope on the road, with culverts, water bars, or other features built in to interrupt surface flow and take it off the road in desired locations. Seasonal dirt roads are often also seeded with a grass cover crop. A key piece of annual maintenance in the rainy season (remember those?) is to survey all the cross drain culverts. These are the small pipes that carry water from the uphill side ditch, under the road and onto the forest floor. 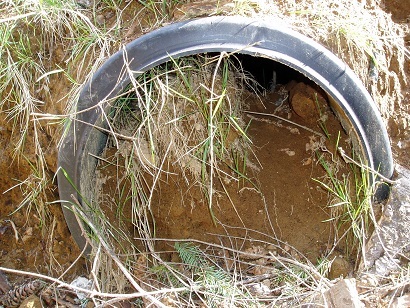 Debris built up in the ditch and culvert basin can block the culvert opening. 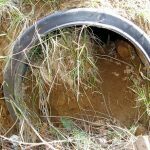 A blocked culvert can cause water to back up and flow over the road, eroding surface and base, or even in rare cases, lead to a serious blow out. So it is worth thinking about roads, the benefits they bring to you as a landowner, but also some of the impacts they can have on our water resources. I encourage landowners to get out and take a good look at their roads this winter, to see how things are. More on this soon.